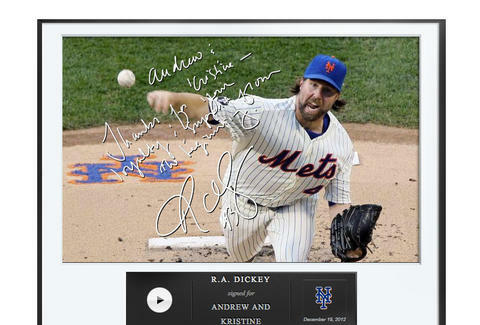 Boasting affiliation with 300+ current and retired pro MLB and NBA players, Egraphs can get everyone from RA Dickey to Hakeem Olajuwon to Chris Herren (yes, seriously, that Chris Herren) to record custom audio messages and "sign" a headshot for you direct from their iPad. They're then packaged together as a digital file and delivered via e-mail. Though not directly from Chris Herren's personal Hotmail. You're not that lucky.